The links provided in this section will help expedite your site visit. We know how valuable your time is and want to make sure you have what you need before your visit at your finger tips. 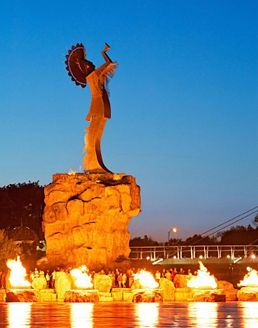 The Keeper of the Plains is a 44-foot tall steel sculpture standing at the point where the Big and Little Arkansas rivers join together in downtown Wichita. We are glad you are visiting our site and our home town of Wichita, Kansas. We'd like to help make your stay a little more comfortable. Please see below for our airport details, our hotels, our restaurants and a few of our local attractions. We hope you enjoy your stay! Click here to find your flight info, your ground transportation options, as well as a flight guide option. If you have a quick second take a look at the video/photo library. You will be surprised! As Wichita Dwight D. Eisenhower National Airport was under construction from October of 2012 and wrapped up in April in 2015. If you are here for more than a day where are you going to stay? Where do you want to stay? Do you prefer to stay close to the airport or venture out a tad and experience the Wichita life style? The links provided below will help narrow your search! Now it is time to think about the FOOD! Below you'll find links that will take you to some of the finest eateries in the ICT. Wichita has a diverse mix of over 1,000 restaurants. 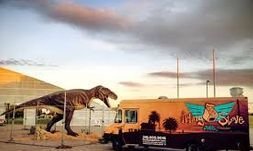 If you happen to be a foodie you'll want be sure to check out the Wichita Food Trucks link! Wichita is the largest city in the state of Kansas. Wichita offers a wide variety of attractions and entertainment for individuals, couples and families alike. If you find you have a bit of free time during your stay here, be sure to venture out and experience the liveliness of what Wichita has to offer! We hope you have a pleasurable experience! The links below will provide you with a multitude of options.